George's first book, True North: Exploring the Great Wilderness by Bush Plane, which is based on experiences gathered during 38 flights through Alaska, the Yukon, the Northwest Territories and northern Quebec, rode the Canadian Bookseller's Coast to Coast bestseller list for 3 months in 2000-1, and was published in the U.S. by Globe Pequot in 2002. 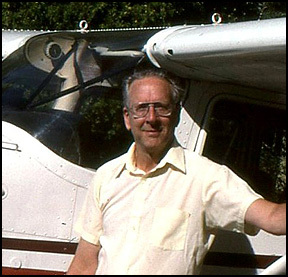 In April, 2001, Dr. Erickson was named the Author of the Year 2000 by the Minnesota Aviation Hall of Fame for True North and for his many articles on aviation. True North is in its 3rd printing in the US and Canada. The author's writing and photographs have sold to Mpls/ St Paul magazine, Dental Survey, Arctic in Colour, the Humanist, Private Pilot, Minnesota Flyer, Mn Journal of Law and Politics, Northern Pilot, Airways, Minnesota Monthly, the AOPA Pilot, Minneapolis Star Tribune, the St Paul Pioneer Press, Motorcycle Tour & Cruiser, Cessna Flyer, and Piper Flyer. His second book, Time Traveling With Science & The Saints was published by Prometheus Books of New York in April 2003. His third book, Back to the Barrens: On the Wing with da Vinci & Friends, the sequel to True North, which was published by Hancock House in January 2008, contains 50 unique photographs. His fourth book, Eyes Wide Open: Living, Laughing, Loving and Learning in a Religion-troubled World, an anthology of new and published short fiction and non-fiction stories and articles, was published in May, 2010 by the American Humanist Association. Dr. Erickson has presented travel and nature Power Point lectures to a wide range of audiences, including University of Minnesota Extension classes, the Bell Museum of Natural History, the Minnesota Seaplane Pilots Assoc., the world-famous Experimental Aircraft Association meeting at Oshkosh, Wisconsin, annual conventions of the Civil Air Patrol, the Canadian Owners and Pilots Assoc. and the annual meeting of Wilderness Medicine Professionals. His travels have taken him from the top of the Rocky Mountains to the depths of the Grand Canyon, and from the Arctic coast to the Great Barrier Reefs of Australia and Belize. He has hosted The Voice of Reason, a cable TV program produced by the Humanist Association of Minnesota, and has promoted True North on public and commercial radio and television. The author donates all of his book profits to educational charities.